LibreOffice has styles for tables that define number format, alignment, font, border, and patterns. There are several that you get with the LibreOffice installation, and you also can create your own to use over and over again. These are known as AutoFormat, and you can access them through the AutoFormat window. 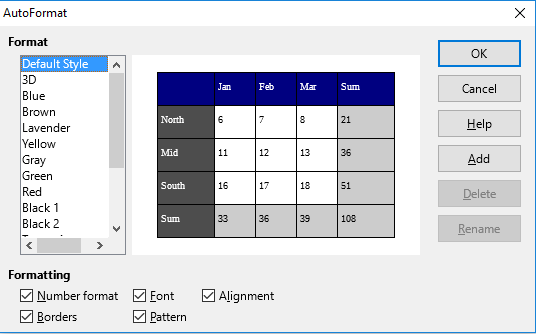 The window can be opened through the Insert Table window, the Tables toolbar, and Table menu. This article will cover how to apply and create AutoFormats. It will go through the different features of the AutoFormat window. Click the table so the cursor is in one of the cells. Click the AutoFormat styles icon. This will open the window. Click the AutoFormat Styles item. This will open the window. By clicking More Options after clicking the Table icon in the Standard toolbar. Click the AutoFormat button. This will open the window. Format: This list, on the left side of the window, has the preset formats that come with the installation of LibreOffice. It also will include any formats that you created. Preview area: This view of a table shows you what the chosen style looks like. If you add or remove different parts in the Formatting area, the preview table will reflect this. Buttons: These allow you to apply, make changes to, or cancel the choices in this window. Number format: This is the style of numbers. It includes the font, decimals, etc. Font: This pertains to numbers and other text. Alignment: This sets the text in a cell to one of the following: left, centered, right, or justified. Borders: This is width, color, and line style of the lines of cells and table. Pattern: This includes the colors for rows, columns, and cells. OK: This confirms the choices you made in the window and applies them to the table. Cancel: This closes the window. Any choices you made will not be applied to the table. Format it the way you want it. When the Add AutoFormat window opens, type a new name in the text box. Click the OK button in that window. 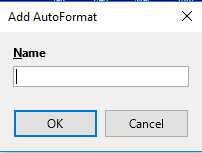 If you are finished with the AutoFormat window, click the OK button in it. Help: This opens the help section to the article about formatting a table. Delete: This allows you to delete any of the formats in the format list, except for Default Style. First select the format you want to delete, then click the Delete button. Rename: Click on the format you want to rename, then click this button. A Rename AutoFormat window will open. Type the new name in the text box. Click the OK button.